I know some of your kids have already returned to school. My son's first day (of second grade! When did he get so big?! He's practically a teenager!) isn't for a couple weeks. But I'm already getting into back-to-school mode—like, how am I going to get this kid back on a regular sleeping schedule?! One thing I've definitely got a handle on is breakfast. 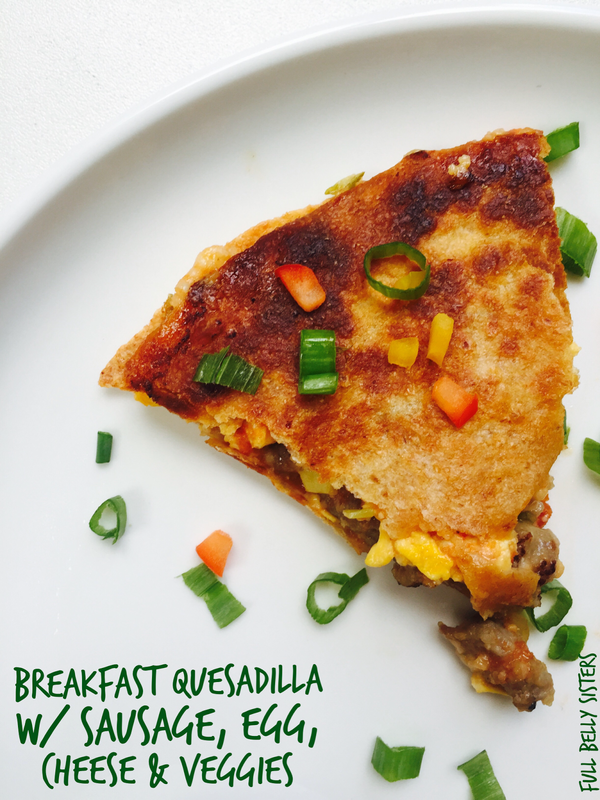 So when I was invited through The Daily Meal's Culinary Content Network to participate in the @Johnsonville #backtoschoolbreakfast contest, I knew I had to make some delicious breakfast quesadillas! These quesadillas are a fun and hearty dish that will give your kids loads of energy throughout the morning. Not only do the quesadillas provide plenty of protein, they've also got fiber and carbs from the whole wheat tortillas, and Vitamin C in all the vegetables. It's a breakfast designed to be playful—but also incredibly satisfying. Heat a skillet to medium. Break the sausages into small pieces and place in the heated pan; add scallions and the other vegetables. Cook until the crumbled meat is browned and the veggies have begun to get tender. Remove from the pan to a plate. Wipe out the pan. Add some olive oil and set over medium-low heat. Pour in the whisked eggs, stir gently until they are set, and remove from the heat. Brush oil (or use cooking spray) on one side of two of the tortillas; place them, oiled-side down on an ungreased baking sheet. Take half the cheese and sprinkle it over the two tortillas. 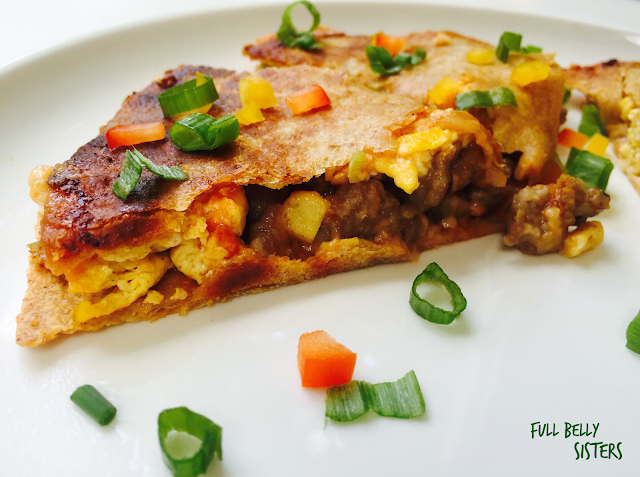 Top that with a layer of eggs on each tortilla, a spoonful of salsa, and the sausage and vegetable mixture. Then top everything with the rest of the cheese. Place the last tortillas on top, press down gently, and then brush the top of the tortillas with oil. Bake for 8-10 minutes, or until golden brown and crispy. Cut into wedges. Serve with additional chopped scallions and peppers, and with a side of salsa for dipping. You can get most of this dish prepped ahead of time: chop all the veggies, shred the cheese, brown the meat—heck, you can even scramble the eggs! Then just assemble and bake the quesadillas while the kids are getting dressed for school. Super easy, I promise. This is one hearty breakfast! 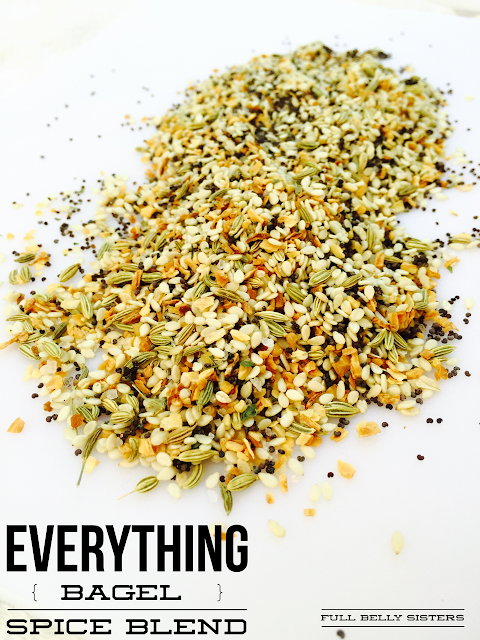 This recipe is a contest entry for a Johnsonville promotion. It is not a sponsored post. 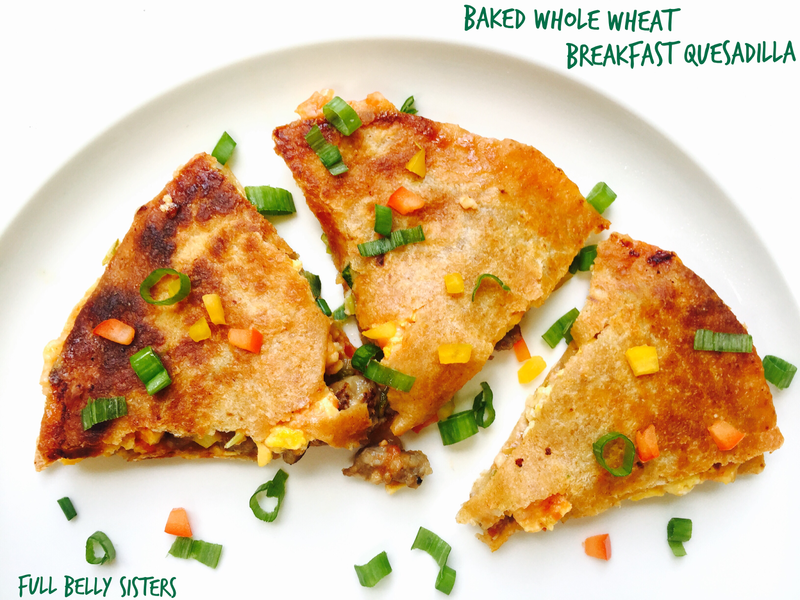 What do your kids like to eat for breakfast on school days? What a perfect looking breakfast. I love those sausages! Love the idea of a breakfast quesadilla. I don't think I have ever done that and this looks so tasty. The perfect weekend breakfast, I wish I had it right now. Oh nice idea, we often make pizzas with flatbreads but like the baked quesadilla idea. I can't even tell you how much I love sausage. What a tasty breakfast! This looks like a great kids breakfast! My grandkids would scarf this down! Always looking for new breakfast ides. Sounds great. Just the perfect way to start your day! What a great healthy breakfast idea! 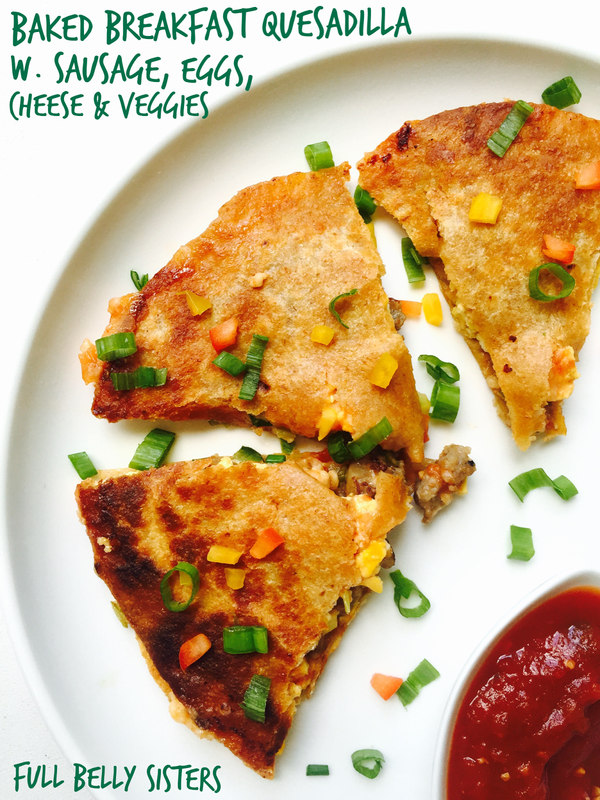 What a fun and yummy quesadilla...love this! Our kindergartener started back a couple of weeks ago and we are always looking for healthy, on the go breakfast options like this one!! Thanks!! What a fun and easy breakfast. Great idea. And I can make this with gluten free tortillas. Yesss! 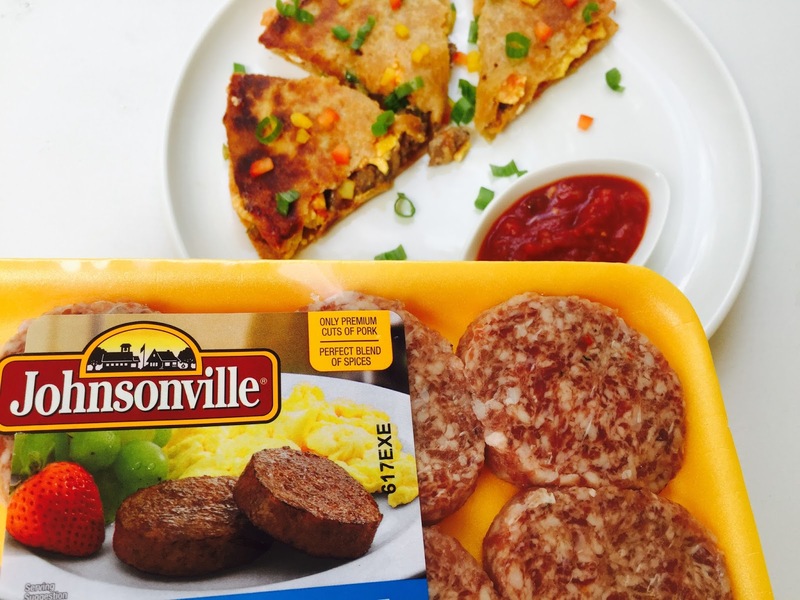 Johnsonville makes the best sausage & brats!!! Your quesadilla recipe looks fantastic! !